Picasso met the young divorcée Jacqueline Rocque in 1954 and, eight years later, she became his second wife. 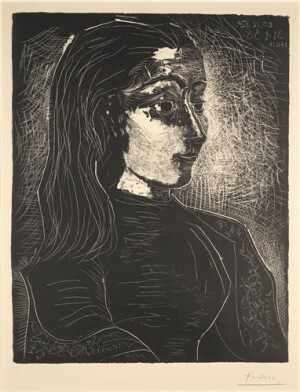 This is one of a series of prints he made of her in the late 1950s, the majority of which depict her bust-length. Picasso has experimented with the traditional method of making a lithograph. 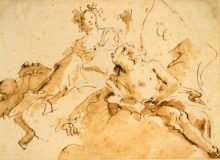 Instead of drawing the sitter’s features in black against a white background, he inked the entire stone and scratched through this so the figure emerges in white against a black background.